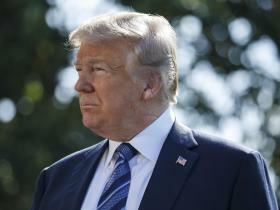 President Donald Trump has accused the federal investigators probing his campaign’s alleged ties to Russia of “meddling” in the US midterm elections. The tweet was a reference to special counsel Robert Mueller’s team, which is investigating Russian interference in the 2016 election and probing allegations that Moscow worked in concert with the Trump team. Thirteen of the 17 members of Mr Mueller’s team have previously registered as Democrats, according to the Washington Post. Mr Mueller himself is a Republican, who was appointed to his role by a fellow Republican – Deputy Attorney General Rod Rosenstein. Mr Trump has repeatedly called the investigation a “witch hunt,” and called allegations of collusion “fake news”. But Tuesday was the first time he turned the word “meddling” – a term often used to describe Russia’s alleged actions during the US election – against the investigators. He provided no evidence that the team was “meddling” in the midterm elections, which will determine the balance of power in the US Congress in November. It was not the first time the president had made unfounded allegations about the Mueller investigation in recent days. Last week, he claimed the FBI had planted a “spy” in his campaign to aid his Hillary Clinton, his election opponent. Several outlets have reported that the FBI had sent an informant to speak with members of the Trump campaign during the election, after the bureau found evidence of suspicious contacts with Russia. Former Director of National Intelligence James Clapper said the informant was placed to gather information about the Russians, not to spy on the Trump campaign. Even after receiving a classified intelligence briefing on the subject, top Democrats in Congress said they had seen no evidence to support Mr Trump’s claims. Mr Trump has stepped up his attacks on the Mueller team in recent weeks, as the midterms approach and the investigation drags on far past what the White House predicted. He also accused the media of running “the most highly sophisticated & dishonest Disinformation Campaign in the history of politics”. Four members of Mr Trump’s 2016 campaign team have been charged in connection with the Mueller probe thus far, including his former campaign manager, Paul Manafort. The president’s long-time personal attorney, Michael Cohen, is also under criminal investigation in New York following a tip from Mr Mueller’s team.